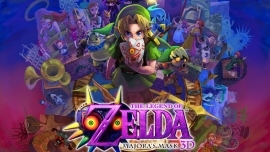 Daily Debate: Did Majora’s Mask 3D Have a Good Reveal Trailer? When Majora’s Mask 3D was finally revealed two weeks ago, it seems the entire world imploded; Zelda fans had been fighting for this game for years, and the announcement was unexpected and absolutely marvelous, with the game looking even better than expected. Looking back on it, however, we have to ask the question: was the trailer actually that good? We’re not disputing the announcement itself—whether you were happy or not is a whole other discussion—but the actual trailer, and the way Nintendo chose to announce it. The trailer itself had no famous music or overly cinematic cutscenes; in fact, the footage we got of the game was very basic, with just a couple of simple scenes and landscapes shown off. Honestly, I didn’t like the trailer at all. Yes, while watching it for the first time, it was incredible, as I’ve been waiting for this game for ages and was taken completely by surprise with the announcement, but in my opinion it really held nothing special, and didn’t show off the game in such a good light. I can imagine that lots of non-Zelda fans, or younger fans who never knew the game, were left with very confused feelings, and they probably weren’t very excited to buy Majora. Nintendo has always been criticized for their poor marketing skills, but in recent years, they’ve done an amazing job with game trailers and announcements. Look back to the Zelda U reveal at E3, or the Little Mac for Smash reveal trailer a few months before then; both of those were beautifully animated, with awesome music that lent to the euphoria of the announcement. If the trailer had adopted a more dramatic feel, perhaps with a famous song like the Clock Town theme or the Stone Tower Temple theme, it could have easily done a better job. Or it could have gone a different direction entirely, and used a much more depressing style reminescent of the actual game, playing a song like the Song of Healing or the Giant’s Aria. Either way, both would have worked better than what we got. Some think that the trailer was actually very good, and tons of fans enjoyed it immensely; the drums did give us a more solemn effect, and the footage shown off made the game seem millions of times better than it was on the Nintendo 64. What did you think of the trailer, now that we’ve had some time for the euphoria to die down? Did you like it? What could they have changed, if anything? Let us know in the comments!